Help your child learn to listen and build with this great LEGO DUPLO Bricks and Books set. The easy-to-follow illustrations and engaging story line make building fun, while familiar objects will fill your child with an immense sense of pride. 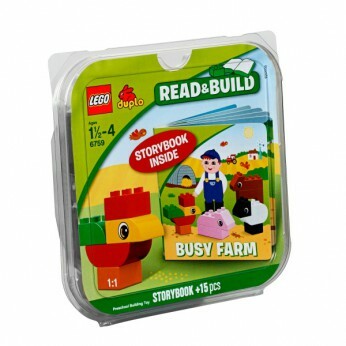 Busy Farm is the perfect introduction to LEGO building fun! For Ages 18months and up…. Set features 15 LEGO DUPLO bricks. LEGO model number: 6759: Inspire young minds with the iconic farm theme. Teach your child to listen and build while having fun. Ecome a building mentor for your child; Enter a world of creative building fun; DUPLO products are fun and safe for younger hands. For ages 18 months and over; EAN: 05702014840331. * 3974274 9.15. Help your child learn to listen and build with this great LEGO DUPLO Bricks and Books set. The easy-to-follow illustrations and engaging story line make building fun, while familiar objects will fill your child with an immense sense of pride. Busy Farm is the perfect introduction to LEGO building fun! This toy costs approximately £9.99 (for the latest and best prices make sure you check our retailer list for the LEGO Duplo Busy Farm 6759 above). In our review of LEGO Duplo Busy Farm 6759 we classed it as being suitable for ages 6 years, 7 years, 8 years, 9 years, over 10 years but recommend you check the manufacturer specific advice before purchasing.